The Consolidated Appropriations Act, 2018, signed into law on March 23, 2018 (Public Law 115-141), funds the Federal government through Sept. 30, 2018. It includes increased funding of $12.2 million for CDC’s vector-borne diseases activities and an increase of $353.6 million for the National Institutes of Allergy & Infectious Diseases, NIAID, which is the NIH Institute that funds Lyme disease research, influenza, and other infectious diseases. 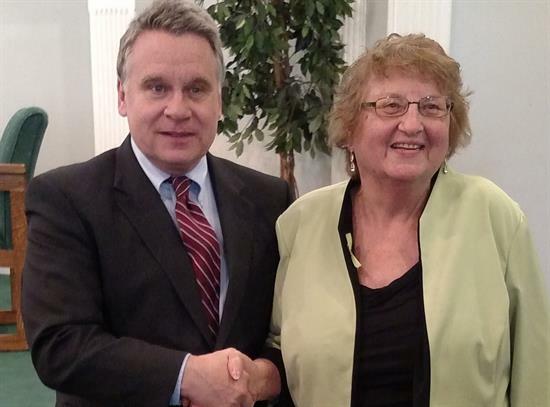 Congressman Chris Smith & Pat Smith, LDA Pres.The Consolidated Appropriations Act, 2018, signed into law on March 23, 2018 (Public Law 115-141), funds the Federal government through Sept. 30, 2018. It includes increased funding of $12.2 million for CDC’s vector-borne diseases activities and an increase of $353.6 million for the National Institutes of Allergy & Infectious Diseases, NIAID, which is the NIH Institute that funds Lyme disease research, influenza, and other infectious diseases. Vector-borne diseases funding cannot be found in the actual language of the consolidated bill, but can be found in the joint explanatory statement for the Consolidated Appropriations Act, in Book III of the Congressional Record for March 22, 2018. Similarly, 2017 Vector-borne Diseases funding can be found in the May 3, 2017 Congressional Record. In addition, each individual appropriations bill that passed either the House or Senate Appropriations Committee has a committee report that provides explanations of Congressional intent and directions to agencies in expending appropriated funds, such as referenced below. The Lyme Disease Association, Inc., LDA, worked with the office of Congressman Chris Smith (NJ) in developing several provisions that were included in the appropriate committee report, i.e., H. Report 115-244. Those provisions included: ensuring transparency, input from treating physicians and representation of the broad spectrum of scientific viewpoints in CDC’s physician education program for Lyme disease; a written rationale for treatment guidelines included on CDC’s website; research that will increase understanding of full range of Lyme disease processes and physiology of Borrelia burgdorferi and B. mayonii, including mechanisms of persistence; development of more sensitive and accurate diagnostics for Lyme and other TBD, including next generation PCR and new methodologies, such as omics; a bibliography of peer-reviewed TBD literature to include literature on possible mechanisms of persistent Borrelia infection. Other stakeholder and patient advocacy organizations developed report language submitted through members of Congress, including major improvements in surveillance and prevention, expanded research in diagnostics and treatment, requirement for CDC goals and performance indicators.